Three hundred feet south of the Brooklyn Bridge/City Hall stop on the East Side IRT lies an abandoned subway station. Called “the world’s most beautiful former subway station” by Forgotten NY, this station is the City Hall stop that served as in the inaugural launching point for the city’s subway system in 1904. The station is ornate with chandeliers and Guastavino arches embellished with green tiling and decorative skylights. The station is also impractical. It’s a one-way local-only stop 300 feet away from a big transfer point that features both local and express IRT service. It’s built around a very sharp curve that makes the gaps at Union Square seem small. The City recognized these shortcomings and shut the station on December 31, 1945. For fifty years, there it lay empty and unused. Trains on the 6 line would crawl through the darkened loop as they turned from downtown trains into uptown trains, but passengers were urged to dismount at Brooklyn Bridge. In the late 1990s, as the subway’s centennial neared, the MTA wanted to open the old station as an outpost of the Transit Museum. The museum started giving tours, but in 1998, the Giuiliani Administration declared the station a security risk due to its proximity to City Hall. As the centennial came in 2004, the Transit Museum received permission to reopen the station to tours, and a few months ago, the MTA started allowing customers to ride past it on the 6 train. Every few months, Transit Museum members can take the tour of the Crown Jewel of the subway system. It’s an incredible glimpse back in time, and as the station is unique among all of the rest of the city’s 100-year stations, it’s really something to see up close. This weekend, I finally took the tour and brought my camera along with me. While the conditions are tough for photography — it’s very poorly lit inside the station — I tried to get as many pictures as I could. You can view the entire set on flickr. But let’s take a closer look at a few shots. After the train lets out, everyone heads up to the second level for a brief introduction to the station. The crowd gathers underneath one of the iron skylights. (Head-on view here). This skylight is embedded in the ground in City Hall Park. The second level features a restored staircase that formerly led up to a cupola entrance. That entrance is now sealed in and leads to City Hall Park. Customers would come through that entrance and see this gateway to the platform. The station is known for its arches and skylights. The skylights were painted black during World War II to hide the light from potential air raids. Some of the skylights no longer have any glass. The chandeliers are original too, and some are in better shape than others. Plaques commemorating the founding and building of the subway line the wall opposite the platform. This one honors the engineers; this one the construction company and August Belmont; and this one the opening of the subway. Check out the wide gap and the extreme curvature of the station. Your intrepid blogger poses next to a City Hall sign and underneath the entryway to the platform. Just a minor correction. 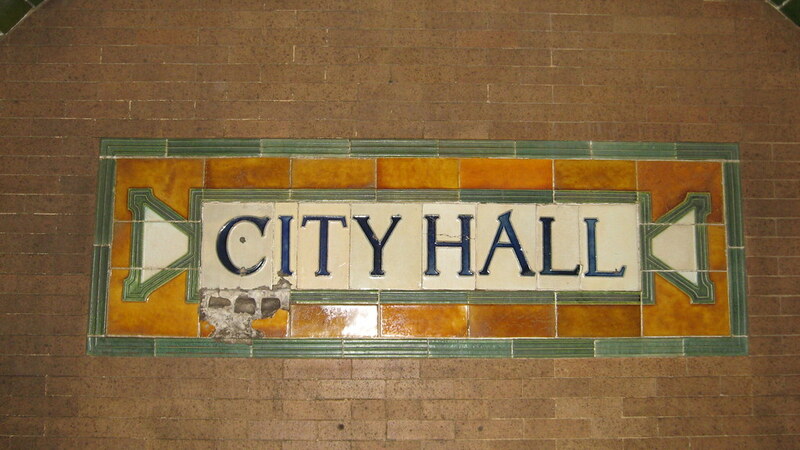 The tile is Guastavino, not Gustavino. As I can’t access YouTube from work this is the best I can do. I believe this is the link to one of three City Hall Station videos I have posted. It’s an amazing station.